Celebrating the Champions – Ghazalat Al Khalediah. Al Khalediah Stables in the Kingdom of Saudi Arabia, owned by HRH Prince Khaled bin Sultan bin Abdul Aziz al Saud, has enjoyed much success in the show-ring over the years, most notably with their stallions Marquis (Marwan Al Shaqab x Rohara Magnifica by Echo Magnifficoo), Baanderos (Marwan Al Shaqab x HB Bessolea by Besson Carol) and Dakharo (Dakar El Jamaal x FOF Kharolina by Padrons Psyche). Between them, these three giants have won countless titles in Europe, the Middle East and the United States including at the Arabian Breeders’ World Cup in Las Vegas, the Paris World Championships, the All Nations’ Cup, and the Dubai International Arabian Horse Championships. The farm has also enjoyed much success with some of their homebred horses, notably the Dakharo daughter Layan Al Khalediah (ex Padrons Amour by Padron out of HM Ferlita), who was named Junior Female World Champion while still a yearling while her sire took the Senior Male Championship, and Fakhr Al Khalediah (Marquis x Barah Al Khalediah by Abha Ifni). 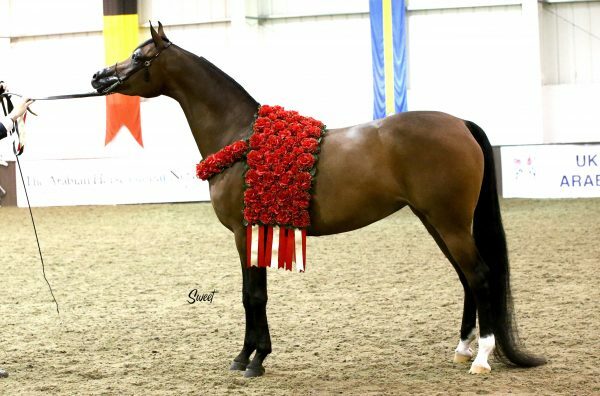 Fakhr Al Khalediah has won several high-profile titles including Bronze World Junior Male Champion and Silver titles at the All Nations’ Cup, the Prague Intercup and the Ströhen International B Show while a colt, plus Silver Senior Male Champion at the UK International Arabian Horse Show in 2014. Ghazalat Al Khadediah. Credit Sweet Photography. One young mare has consistently been representing Al Khalediah Stables, however, for the past couple of years and that is the bay beauty, Ghazalat Al Khalediah. Sired by PA Gazsi, a three-quarter brother to double World Champion Marwan Al Shaqab (ex Little Liza Fame out of Katahza by Aza Destiny), being sired by Gazal Al Shaqab (Anaza El Farid x Kajora by Kaborr) and out of Memphis NA (Fame VF x Careliss Whisper by Laddinns Fire). Ghazalat Al Khalediah’s dam is Argentinna SS (Arius SS x Taki Padron by Padron). 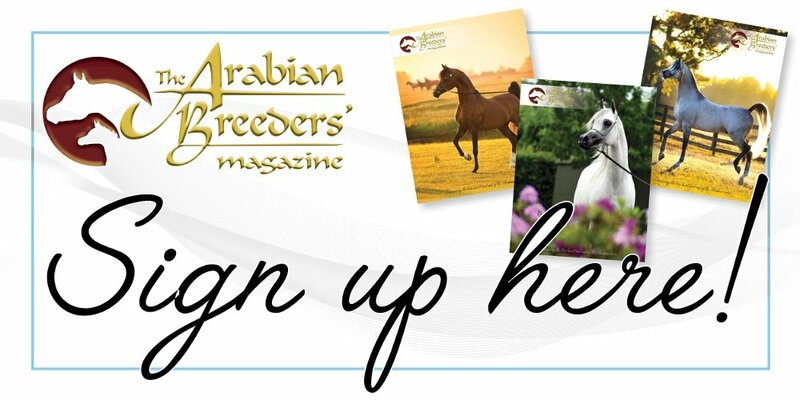 Bred in the United States, Ghazalat Al Khalediah was named Reserve World Champion Yearling Filly at the 2011 Paris World Championships, and she has continued to shine at shows across Europe. More recently, this big-moving bay took the Silver Senior Female Championship at the Ströhen International B Show in 2015 and added a Gold Senior Female title to this at the Prague Intercup the same year. Ghazalat Al Khalediah ended her 2015 success when she took the Gold Senior Female Championship at the International A Show at the Salon du Cheval d’El Jadida in Morocco last October. 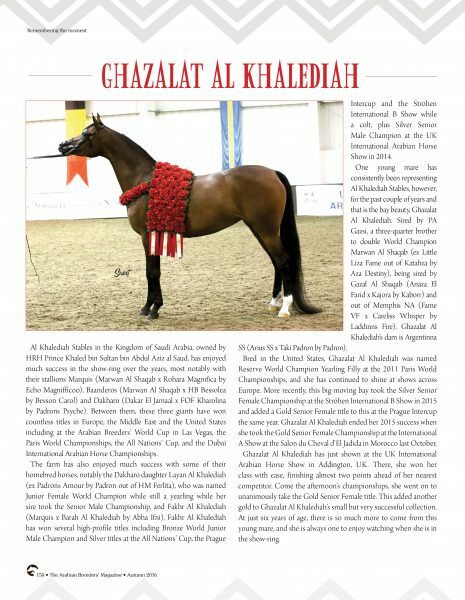 Ghazalat Al Khalediah has just shown at the UK International Arabian Horse Show in Addington, UK. There, she won her class with ease, finishing almost two points ahead of her nearest competitor. Come the afternoon’s championships, she went on to unanimously take the Gold Senior Female title. This added another gold to Ghazalat Al Khalediah’s small but very successful collection. At just six years of age, there is so much more to come from this young mare, and she is always one to enjoy watching when she is in the show-ring.